The Aztec woman had various roles in her life and in Aztec society.While Aztec men were war oriented, the Aztec women were not. 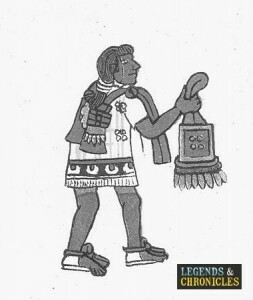 Most Aztec men were led to conquer other territories and being away from his home made it impossible to live without the help of an Aztec woman, who would be more highly considered by all the better she was with domestic chores. In this way the Aztec women had what would be considered a traditional female role in society. For an Aztec woman to be desirable to an Aztec man, she relied solely on her cleanliness. She also followed a strict code of behaviour. She had to be modest, demure and very simple, and simplicity for an Aztec woman meant no make-up. Wearing make-up was actually reserved for the Aztec prostitutes, therefore most Aztec women would not even consider it. Clothing and jewellery was important for an Aztec woman and they adored bright coloured clothing and lots of shiny jewellery. There were certain restrictions to jewellery that were actually reserved for the noble women and this was even enforced by law in ancient Aztec society. Materials such as gold, feathers, and precious stones made a woman more desirable, and therefore noble women wanted to be the most desirable. 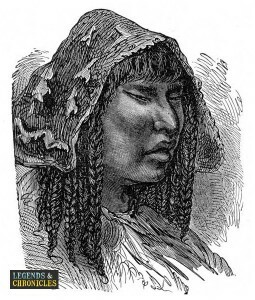 The Aztec woman would wear her hair long and straight, and it was only the priestesses who cut their hair short or bald to symbolize their chastity. For an Aztec man to marry an Aztec women then a serious of events would have to occur first, marriage in an ancient Aztec society was very different from modern traditions. Typically the Aztec man would ask a council and not a woman’s father for her hand in marriage. The council determined the compatibility of the man and woman, which is very different from modern proposals. The next stage would fall down to an elder Aztec woman, she would initiate courtship of the man to a woman, and would also be the one who will tell the father of the woman of the man’s intention for marriage. Aztecs were only allowed to marry someone from the same clan. Regular Aztec men of the time could only afford only one wife, while the noble Aztec men could have several wives as long as each of them are cared of suitably. However, the festivities of a grand wedding were only given to the first wife of any Aztec man. If an Aztec man failed to care for one of his wives, and the family of the Aztec woman discovers that she is not cared for, the family can fetch her back. There is in fact a story of a Prince named Axayactl who had a little sister named Little Precious. She was married to the Lord of Mexico who mistreated her. When the Prince learned of his sister’s predicament, he immediately attacked the city. This shows how much the Aztecs valued their women. At home, the Aztec woman is the cook and the housekeeper. She would spend hours on grinding maize, their staple food, used for making flour and tortillas. She would also can rear crops and take care of dogs and turkey, their main source of meat. An Aztec woman was also able to run a business related to crafting or weaving, and she would also make clothes for the family selling or trading any excess cloth for the family necessities. After a while the Aztec woman would be expected to bear children with her husband and they were even treated more precious than before. If for men status is elevated by bravery in war, women are elevated to goddesses if they die in childbirth. It is an Aztec woman who acts as a midwife. When a baby is born and the mother decides that she would like her to be a priestess, she would take the young baby to the temple where the mother would establish an agreement with the priest. Later when the girl turns five years old, she is taken back to the temple to learn writing and interpreting pictographs, reading the calendar and prophecy. Priestesses actually played a major role in religious rituals and were the ones that kept the temple clean and lit the fires. If an Aztec girl who not taken to the temple to pursue becoming a priestess, then she would remain at home and learned domestic chores by watching and copying her mother. By the age of seven an Aztec girl is given various household chores and also taught how to weave and grind corn. The little girls were not allowed to speak up generally and to talk to boys was forbidden at this age. Although the Aztecs would punish their children, the Aztec mothers generally treated their children as treasures, trying to protect and teach them in order to ensure their future success. By the age of fifteen, the Aztec girls would go to school to learn more weaving and decorative skills like feather making. Aztec girls could even get married at this age, it was not uncommon, or they may wait until they finished school which would be at around twenty years old. Aside from the major role of home keeper women in Aztec society had other options should they wish to pursue them. Some Aztec women would also be venders or merchants in the market, they could sell food, or clothing, materials and even decorative items. Aztec women could also choose to be a courtesan or prostitute, they were from all reported not treated with any negativity or as outcasts as they commonly danced with brave warriors. In every society there are curers and midwives, and in Aztec society this was generally a woman’s job. Historians commended the Aztec Healers to be better than European doctors of the time, but religion made the Spaniards destroy any historical findings about the methods and cures that were used, and many of the Aztec methods of healing and medicine were unfortunately labelled as witchcraft. For noble Aztec women there was a little more choice and option in their jobs and roles, as they would be able to serve emperors as secretaries, or scribes, or even as bookkeepers, and general administrators. An Aztec women would typically fill a traditional role of a woman in society, she would be concerned with family life and raising children. An Aztec women would bestow love upon her family, and provide clothing and perform many household duties. As well as this an Aztec woman could easily have a career, she was able to run her own business, trade at the market and much more. She could also become a priestess just like an Aztec man, or even choose a life of medicine and healing, or become a midwife. In short the Aztec woman could be many things, she had choice and freedom and even after marriage her family would keep a watchful eye over her.